Temescal will release a special anniversary IPA this Saturday. I won’t pretend that I’m not a loyal Temescal Brewing drinker. Like other admirers, I’ve hunted down and relished each and every can release — delicate and easy-drinking hoppy brews (Staycation was a favorite) that aren’t sweet or doughy, and zippy pilsners (such as the latest, Lovely Pils). It’s also easy to lose track of time on the brewery’s welcoming, expansive patio, where there are typically top-notch local eats by the likes of Tacos Oscar to Okkon. And that’s why I’ll be at Temescal this Saturday: to show appreciation for the brewery on its first anniversary. Owner Sam Gilbert explained during a recent phone interview that its been a year of feel-good community vibes and unexpectedness. He admitted that Temescal “definitely threw out the playbook about a month in” after opening — as is the case with breweries that experience wild successes in those opening months. He says he didn't anticipate brewing as much hoppy beer as they do, but, nevertheless, Temescal also keeps trying to push drinkers to new places, such as with its Scotch Ale, now on the menu, and its rustic, traditional saisons. To celebrate this neighborhood-brewery haven, Temescal will pull out a helluva lot of stops on Saturday for four hours. There will be a bounce house, food by Homeroom, plus some special tappings of fruited casks. 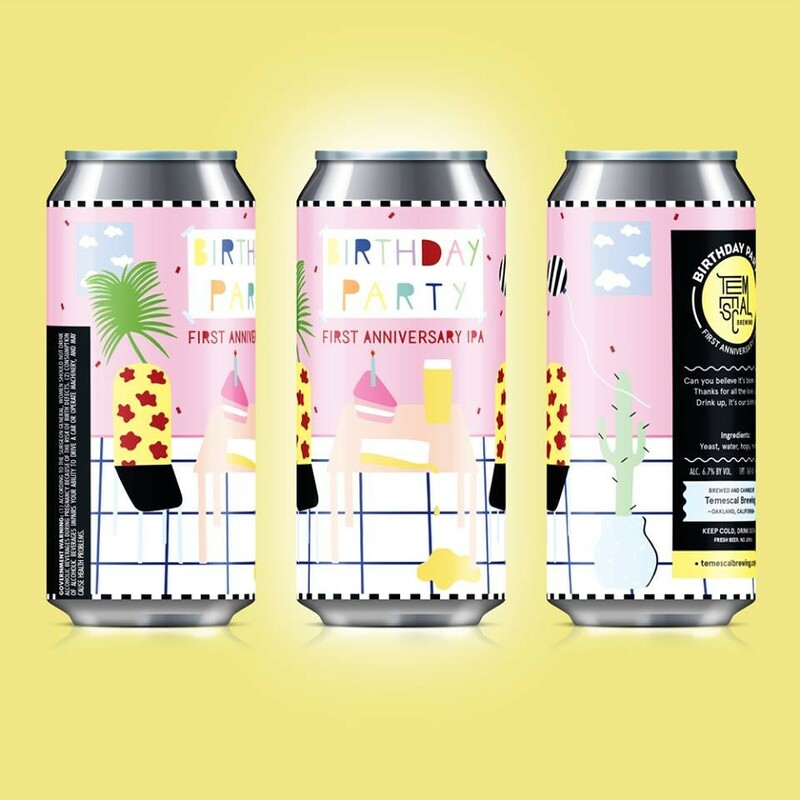 And they’re even releasing a one-off anniversary IPA, in cans — the first beer they’ve brewed a second time — the aptly chosen Birthday Party, with label design by local artist Sarah Bowser (see photo). Gilbert said there are more surprises, which he wouldn’t yet divulge. A year in, he seemed genuinely moved by the enthusiasm his brewery. “It doesn’t feel like it’s ours any more, in a way, which is great, which is exactly what we want,” he said. Saturday, June 17, 2-6pm, 4115 Telegraph Ave, Oakland.